Moriesian Breeders and Stallions Directory - O Horse! Small family run farm. We are not a riding barn but can provide board for layups or short term horse care. We are able to start your colt to saddle or harness using hybrid-horsemanship. Also breeding 2nd generation Moriesian horses! Moriesians & carriage service. 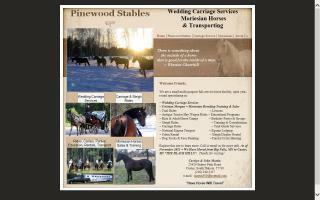 We are a multi-purpose full-service horse facility located in Northern Minnesota specializing in wedding carriage services in the 5 state area and Friesian/Morgan = Moriesian breeding & sales. Also: trail rides, lessons, hay rides, group/troops educational programs, kids & adult horse camps, birthday parties, sleigh rides, carriage rides, training & consultations, trail guide services, national equine transport hauling, equine lodging, cabin rental, Christmas sleigh display rental, dog tricks & face painting, & much more. Since 1994. All services available year-round at your place or ours. Call for information & appointment. We specialize in breeding quality Moriesian horses.